Philly Bird Nerd : What Rhymes with Spring? Sing rhymes with spring. And boy were the birds in California singing! Enjoy. We spotted this Dark-eyed Junco singing from a cement statue in Golden Gate Park. Those are Cherry blossoms in the background. 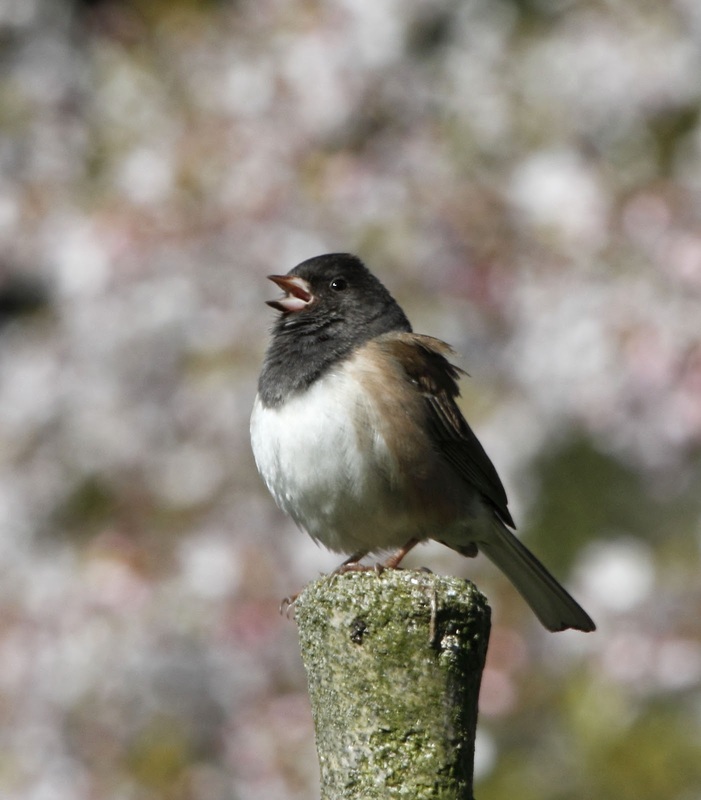 The western variety of this Junco has brown back so it throws you for a loop at first. 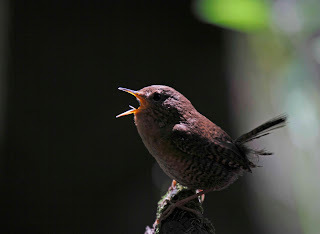 This Pacific Wren was one of the few birds we saw in Muir Woods. 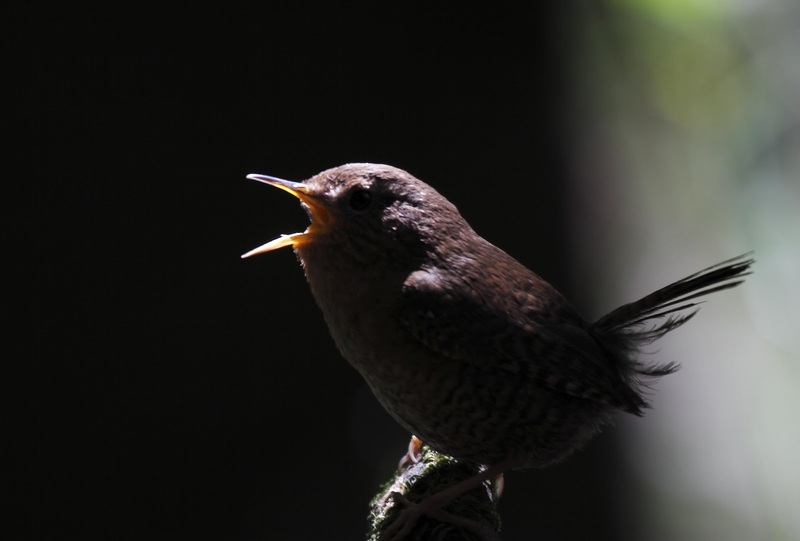 The giant Redwoods are immune to bugs, so there are few birds living in the woods. 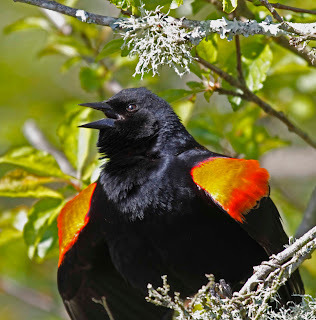 We were lucky to see this guy singing his heart out just a few feet from the path. The sun showed through the trees just enough to light up his beak. 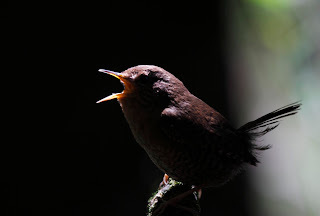 Here is the same bird after I lightened the photo in PhotoShop. This Red-winged Blackbird was showing off his namesake red wings while trying to let everyone know that he was ready to find a gal. 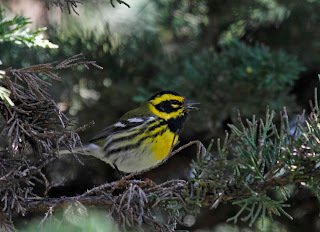 A very western bird, this Townsend's Warbler was one of a dozen or more that were singing in Golden Gate park and other stops along our journey. He has a really great song that makes you want to stop and listen. I wanted to get this quick post in while we had Internet access. Di and I are traveling down California Highway 1 which has awesome scenery, lots of birds, but no cell phone or Internet reception. So, I will post that trip later. There are lovely. Have a safe trip home.